Whilst being gentle enough to use at home, STERIZAR is still potent enough for use in more demanding ways and places. Its advanced formula means it can be applied to a variety of surfaces including walls, floors, doors, sink and baths, telephones, air-con filters, work-tops, mirrors and even soft furnishings. Application simply wipe on to the surface to be cleaned, wipe and spread evenly. 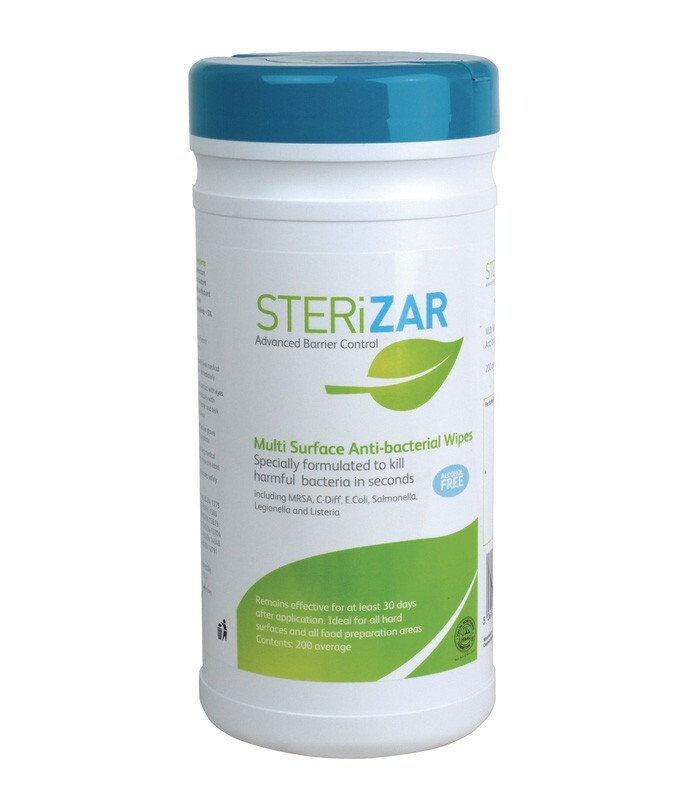 Once STERIZAR has been applied to the surface it remains 100% effective for 30 days, continuing to offer proven protection against bacteria. Regular cleaning with other products will not reduce its effectiveness thanks to its Advanced Barrier Control. 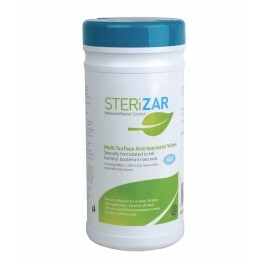 Sterizar can be used in : clinics, dentists` surgeries, doctors` surgeries, food preparation areas, hospitals, transport decontamination, schools, nurseries, nursing homes, vetinary surgeries and equine care. This is the tub version of the product designed to sanitise hard surfaces. There are 200 wipes per tub and they are easy to carry around. Why Use Alcohol Free Products? In addition to being highly flammable, alcohol-based products have been banned from many public school districts in the country, as they pose a significant danger to children who might accidentally or intentionally ingest the product. To put things in perspective, light beer is “6% Proof”; wine is “24% proof”; vodka is “80% Proof”; a number of alcohol based products are “125% Proof”! The risk of alcohol poisoning is quite real, and it is a danger to small children. Alcohol-based hand sanitizers claim to kill 99.99% of bacteria, yet laboratory tests have a difficult time reproducing these results. According to Dr. George Lukasik of Biological Consulting Services in Florida, one of the problems is that without agitation, alcohol only kills the top layer of bacteria, and the dead cells then form a protective layer that keep the alcohol from killing the harmful bacteria underneath. The Sterizar range of products have been certified as Halal approved following a complete assessment of the products by the Halal Monitoring Committee. Designed by a Cosmetic Chemist. Tested to be safe for all food preparation areas. More effective than other disinfectants due to its active barrier. Surface remains secure against further recolonisation of any treated area. Remains active even when dry. Active Barrier Control effective for up to 30 days.